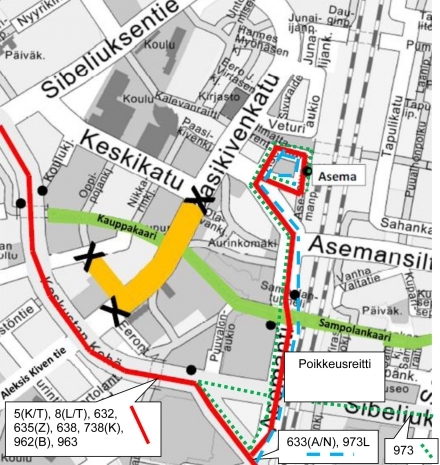 In Kerava, Aleksis Kiven tie and Paasikivenkatu will be closed to traffic between Keskikatu and Torikatu from Friday 9 September 7am to Monday 12 September 6am due to a fair. Bus routes 5(K/T), 8(L/T), U632, 633(A/N), U635(Z), U638, 738(K), U962(B), U963, U983 and 973(L) will be diverted to run via Asemantie. There will be temporary bus stops by Kauppakaari pedestrian crossing.